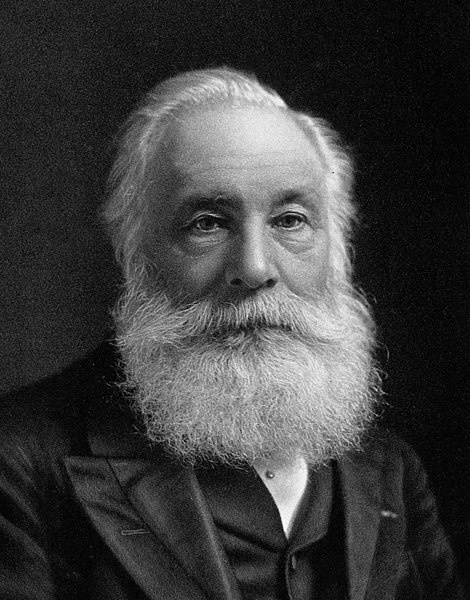 William Henry Perkin was born on March 12, 1838, in East London. He developed an interest in science, and chemistry specifically, while attending the City of London School. At 15, Perkin enrolled in the Royal College of Chemistry, London. He would often conduct his own experiments outside of class, and even built a small laboratory in his home. A photograph of Sir William Henry Perkin. Image in the public domain in the United States, via Wikimedia Commons. During this time, malaria — and the Crimean War — were ravaging Europe. The current treatment at the time for malaria, made out of the bark of cinchona trees, was hard to come by, as the trees only grew in tropical climates. When Perkin was 18, and home from school on Easter break, he attempted to produce a treatment for the disease by synthesizing coal tar into quinine. Although he probably wanted to help snuff out the raging disease, finding a treatment that could be synthesized would have also made Perkin a huge fortune. The results of his experiment were, at first glance, a bust: Instead of quinine, the tar reactions produced an ugly brown substance in Perkin’s beakers. While cleaning them out with alcohol, Perkin noticed that the brown hue changed into a purple-pink color. What Perkin had accomplished was the first successful synthesis of a synthetic dye. Chemists called the color “mauvine” after the malva flower, but it is also known as “mauve” or “Perkin’s mauve”. Three different shades of mauve: deep mauve (left), opera mauve (center), and rich mauve (right). Perkin patented his process for mauvine production in 1856. He left the the Royal College of Chemistry, much to his teachers’ dismay, to set up a manufacturing plant and dye shop in London. As mauvine dye was mass produced, word of the lush new color got around — even Queen Victoria incorporated mauve into her fashion repertoire. Victorian-era style is known in part for its bright, brash colors, many of which William Henry Perkin discovered: mauve, of course; a turquoise hue he called “Perkin’s Green”; and a bright shade of violet. He also collaboratively discovered a method for synthesizing alizarin pigments in order to produce bright crimson paints. 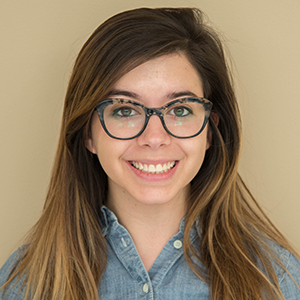 Although it might sound trivial to some, Perkin’s discovery was the starting point for a new chemical industry of synthetic substances, and eventually, synthesized compounds in the pharmaceutical industry. The impact of Perkin’s work seems to have come full circle to his original goal of synthesizing treatment for a disease. In 1874, Perkin decided to refocus his work from manufacturing back to research, where he investigated the concept of optical rotation. 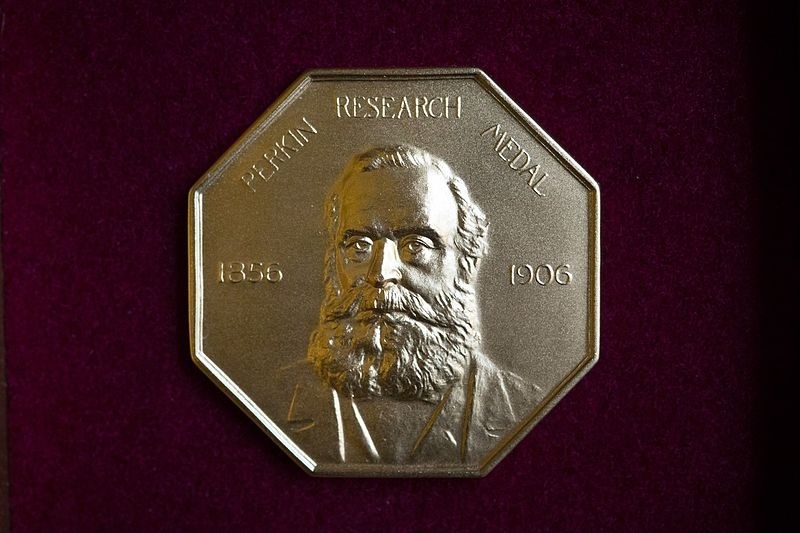 In 1906, the 50th anniversary of Perkin’s discovery of mauve was celebrated in two ways: He was knighted and the Society of Chemical Industry established the Perkin Medal in his honor (he was the first recipient). The Perkin Medal. Image licensed under CC BY-SA 3.0, via Wikimedia Commons. Today, Perkin is regarded as the “father of the synthetic chemical industry”. He is also a father to seven children, three of whom happened to pursue careers in chemistry as well. Let’s wish Sir William Henry Perkin a happy birthday!